Cairobserver, a high quality blog on the urban development of Cairo and city life in general, has published its second print edition in Arabic, with a strong focus on grassroots activities in Cairo and Alexandria. Since it began in 2011, the blog, featuring both English and Arabic pieces, has been a pivotal portal to open a conversation on urban development and the challenges that face Cairo. The first print edition was published with a grant from the British Council in 2012, and featured stories from the blog, along with guest contributions. The second print edition, with its easy on the eye design by Amro Thabit, feels more like a magazine, and besides the thought provoking and enlightened pieces, features actual vintage advertisements along with adverts for culture spaces designed as if they were published in the 60s. 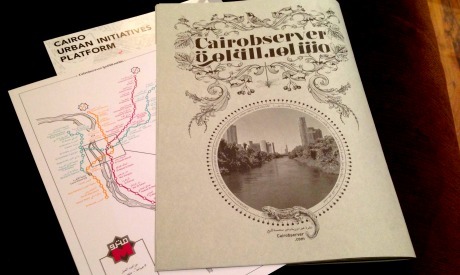 The edition also comes with an insert of a Metro map of Cairo, beautifully designed by Egyptian designer Valerie Arif, along with another insert of a printed version of the Cairo Urban Initiatives Platform (CUIP), an online interactive map of Cairo's initiatives across the fields of architecture, urban planning, culture, media, human rights and NGOs working in the city. The publication starts off with an editorial by Mohamed El Shahed, the one man show behind the Cairobserver blog, who is also a PhD candidate researching the modern architectural heritage of Cairo between the 30s and 60s and questioning the effect of the 1952 revolution on modern Egyptian architecture, introducing the overarching theme of the edition. El-Shahed hosted a crowdfunding campaign in July 2013 on indiegogo, and managed to raise the $5000 he needed to make the second print edition a reality with 59 donors. "The publications attract a new audience beyond the blogosphere, they are also a way to promote the blog," El Shahed explained to Ahram Online. "The content is sourced from people working in heritage, urban planning, construction backgrounds and students and thus connects different circles." Besides this point, Cairobserver has maintained its reputation as the go-to-publication for Egypt's architectural and urban life in recent years. El-Shahed believes architecture is a public endeavour, which has lost its way. Through Cairobserver he continues to engage with many in the conversation on Cairo's urban realities. "The profession is becoming invisible," El Shahed comments. "Engineers do not have a publication that is widely read. The syndicate does not produce any publication that is useful. The work done by engineers is done within gated communities or places that are not accessible. In contrast to the era I am studying [1930s-1960s] where you have publications to do with architecture and people had access to ideas of architecture and building." The publication covers an array of topics. Starting with an article looking into the rights of proper housing in the Egyptian constitution that is being voted on this month, along with a piece on the role of the municipalities of different neighbourhoods in city planning. Another piece covers the story of the residents of Ezbet Khairallah, one of Cairo's oldest informal residential areas, and how the residents make life there work and fought the government in court for their right to live in the neighbourhood. The publication also takes the theme of neighbourhoods to look at other urban development stories. In terms of culture, Cairobserver has always had a focus on arts and culture spaces, and El Shahed believes cultural life within a city is directly related to urban life. "My view of cities in general is inclusive of all the diversity that makes a city exciting. It has artists, dancers and people collecting garbage. The characters, initiatives and activities are what make a city interesting and exciting," he explains. "The main flaw I see with most magazines or prints that deal with urban development is that they are very narrow. They focus on buildings, urban planning, and engineers without having a holistic view around these buildings, and on the streets." Thus the edition features a curatorial text by Maha Mamoon and Alaa Younes on their recent photography exhibition 'Covering One's Back', an article on Egypt's participation in the Venice Architecture Biennale, an article on an initiative called 'Friends of the Egyptian Museum' working to develop the museum, and also a profile of Antoine Selim Nahas, the architect behind many of the iconic historic downtown buildings. Cairobserver, while it is a space to discuss Cairo, is not limited to only that. Since the issues facing the Egyptian capital also face many other cities, El Shahed opens a section in the publication for Alexandria. The section features an article on its architectural heritage, which is being destroyed, by 'Save Alex' initiative's founder Mohamed El-Dessouki, along with an article by Abdel-Rehim Youssef, on Gudran for Arts and Development and how the association has been recycling spaces for arts around the city since 2002. The edition also opens a space for discussing public spaces with two topics: one focused on the community-driven open green space in Ard El-Lewa, an informal area in Giza, along with an article looking at how informal markets have taken over the main city streets and sidewalks. Cairobserver also features a section going through Cairo neighbourhoods looking at historic sites and places that are often overlooked. El Shahed also features two projects by architecture students: one on the redevelopment of a historic house in Darb El-Seyagh, and another to redesign Tahrir Square. Finally, Cairobserver profiles initiatives that are working to make Cairo a better place: Friends of the Egyptian Museum, Studio Emad Eddin Foundation, Megawra, El-Athar Lana, Ismailia for Real-Estate Development, Downtown Contemporary Arts Festival, Mantekty local Newspaper, Studio Meem, Cluster, Nile Sunset Annex, Tadamun, Beirut and Cairo Runners. Overall the edition delivers what it promised - a collection of rich pieces that deepen readers' knowledge of Cairo's urban realities and highlights initiatives that work on the ground to develop that reality into a more cohesive and functional city.